CULTURE IS KING – but only if the organization is in alignment! A positive company culture enables an organization to grow and scale. Core Values are the glue that holds that culture together. Many organizations don’t recognize the value in taking the time to define core values, and they miss a huge – and crucial – opportunity. Core values are often considered something that would be “nice to have.” Something to focus on only after the business is launched and marketing, hiring and profit plans are in place. THEN attention is finally paid to defining the organization’s core values. Only by then, it’s often too late. Without realizing it, these organizations find that the company culture has already been defined by default…not by design. This is where many businesses fail. So why do they miss this opportunity? Some simply don’t know how to do it. Others miss the connection between core values and business growth and scaling. The benefits of establishing shared core values have been repeatedly proven in recent years. When consistently implemented, it’s more than a nice idea … it’s a bona fide necessary marketing strategy and a “need to have”! 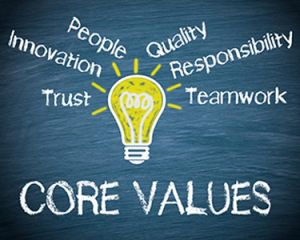 Companies like…Zappo’s, Madison Reed, Ritz Carlton and Southwest Airlines wouldn’t be where they are today had they not started with their “core values” as a foundation. For organizations big and small, successfully defining core values from the start enables growth and the ability to attract ideal customers who know what these companies stand for … what they value. Organizations win when employees win, employees win when organizations succeed and most importantly – the customer wins! When there is a common understanding of the company’s core values, a common purpose is ignited raising the engagement and performance of all employees, increasing sales and adding to the company’s bottom-line. 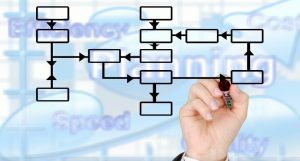 Many believe that they must choose between revenue/profits and investing in the integrity of the organization. But this uncovers a paradox where investing in the integrity of the organization actually increases performance, sales and revenues. If your organization is struggling with these issues, looking to scale or grow and hasn’t been able to define your culture and core values, you may need to change or create your culture. This requires the expertise of an outsider strategist who is objective and impartial and an expert in this arena. Allow me to share my process for identifying strategies, mapping out a solution and helping you to achieve the results you want for your employees and customers. Please contact me so that we can discuss your particular issues and determine if this process is a good match.